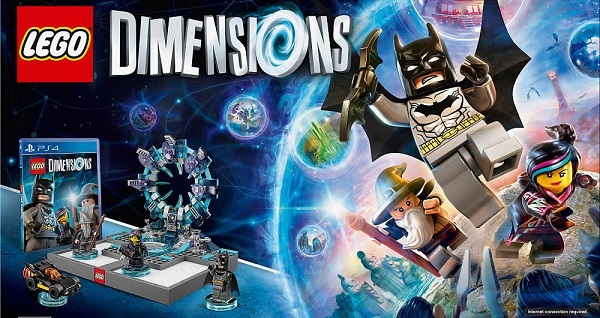 Lego Dimensions looks to be exactly what you would expect out of a property mash-up game powered by those figurines everyone seems to be going crazy for these days: The classic Lego gameplay you’ve grown to know and love, but with brand new mind-bending puzzles and fantastic cameos you never saw coming. Visiting the Warner Bros. Interactive booth during E3 2015, I had an opportunity to go hands-on with the upcoming Lego Dimensions. It’s similar to what you’ve come to expect out of similar games like Skylanders, Disney Infinity or Nindeno’s Amiibos, but with a distinct Lego slant on the whole proceedings. Coming to the PS4, PS3, Xbox One, Xbox 360 and Wii U on Sept. 27, Lego Dimensions is basically a playable version of last year’s hit Lego Movie, by which I mean a fun way to throw a bunch of well-known characters into situations where they can interact. Since the popular build-it-yourself toy company has worked on pretty much every property known to man, they’ve got a huge stable of partners who were apparently eager to let their characters pop up in the game. DC comics characters meet folks from Back to the Future. Chell from Portal can team up with the warriors from Lego’s own Ninjago collection. You might even spy a hobbit hanging out with The Doctor. The possibilities are endless, which is basically the point of the game. When the starter set launches, it’ll boast a portal and the three main characters of the core campaign including Batman, Wild Style and Gandolf. A Batmobile is also thrown in for good measure. You can play as any characters you want throughout the campaign, but all cutscenes will boast this particular trio because, yeah, that would be way too much stuff to animate and write for. Anyway, the story goes a little something like this: A bad guy has figured out how to cross dimensions and, as a result of their tampering, Lego characters from all over the place are crossing worlds. Your band of heroes is set on a quest to fix the problem, which will require you collecting pieces to a very special machine. That machine happens to look a heck of a lot like the portal that drives the Dimensions gameplay and, like the titles it was inspired by, any character or vehicle you place onto the platform in the real world will pop up in the virtual world. You can have up to seven characters and vehicles in play at a single time, which is a pretty hefty number compared to the three or four from other games. Anyway, my section of gameplay began in Oz, where Batman becomes convinced that the (wrong) scarecrow is to blame for all of the dimension hopping. The wicked witch eventually shows up and it’s time to battle. This was where one of the portal’s special functions comes into play. Some of my characters became trapped an unable to move in the game world. Looking at the portal, I saw that they were currently located in a region that had turned bright red. All I had to do was move them to a green section of the portal and, booya, they were free to attack the witch and her minions. Next up was a section of gameplay set within Aperture Labs, of Portal fame. The portal once again became a key factor in puzzle solving, with my moving figurines around allowing them to grow really big or shrink down really small. They could also be placed in certain sections of the portal to immediately transport them to a certain part of the map. Finally, I was dropped into a section of gameplay from Scooby Doo. In order to get the front door of a spooky mansion to open, I had to once again use the portal, this time activating special triggers that would paint on-screen characters a certain color. Once I had them painted and positioned in the correct spot, the door opened. That’s just a few examples of the portal-powered gameplay, too. Another example was basically hide and seek, where the portal glowed shades of red and green until I headed in the correct direction and located a hidden object. On top of all of these mechanics focused on the portal itself, classic Lego game antics are also at play. You’ll need to run around, jump over obstacles, beat up baddies, pull levers and the like to make it from location to location. If you’re into Lego games or any of these titles that encourage you to pick up additional figurines to expand your army of playable characters, then you’ll probably want to keep your eye on Lego Dimensions. It’s the most physically involved of any of these titles to date, tasking the player with actually interacting with the figurines on a regular basis. Vehicles even come with a handful of forms they can be rebuilt into, with schematics on the screen to help you quickly turn the Batmobile into, say, a tank that can destroy objects with sonar waves. As is traditionally the Lego motto, your imagination seems to be the limit with Dimensions. So if you’ve ever wanted to see Marty McFly and Homer Simpson go toe-to-toe with a Balrog, this is probably your best bet.